We believe in ideas that create change. When it comes to public relations, marketing communications, digital and social media – everything is now interconnected. In an ever-changing new media environment, getting the attention of your customers can be a formidable challenge. But now, there’s no reason to worry or to go to multiple agencies to get your marketing communications needs met. Welcome to LCI! We have all the services and expertise you need under one roof. Called “America’s #1 Small PR Firm (Ragan’s Ace Awards),” LCI is headquartered in the San Francisco Bay Area but services clients throughout the country. And, we have 50 affiliate agencies worldwide through our Public Relations Global Network. We’re both B2B and consumer PR experts when it comes to communications for healthcare, consumer technology, consumer goods and services, retail, real estate, financial services, food and beverage, hospitality, home furnishings, senior services, luxury and more. With more than 25 years of experience in PR, marketing, digital strategies, social media, video production, media and presentation training, crisis communications and reputation management, we deliver results that add value to your business goals. We are LCI. The First Step to Your Company’s Powerful, New Image. 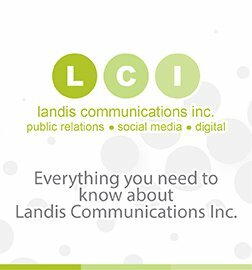 Give us a call at: 415.561.0888, send us an email at: [email protected], or Tweet us at @LandisComm. We look forward to working with you!